"The Kurdish liberation movement is working for a system of democratic self-organization in Kurdistan with the features of a confederation." ~ Abdullah Öcalan, War and Peace in Kurdistan. New strategic, philosophic, and political approaches of the Kurdish liberation movement. 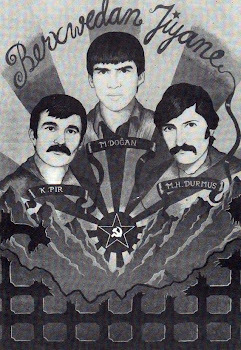 * The philosophical, political and value-related approaches that the newly-aligned PKK embraces find adequate expression in what is called “democratic socialism”. * The PKK does not derive the creation of a Kurdish nation-state from the right of self-determination of the peoples. However, we regard this right as the basis for the establishment of grassroots democracies, without seeking new political borders. It is up to the PKK to convince the Kurdish society of their conviction. This is also true for the dialogue with the hegemonial countries exercising power in Kurdistan. It is to be the basis for a solution of the existing issues. * The countries that presently exist here need democratic reforms going beyond mere lip service to democracy. It is not realistic, though, to go for the immediate abolition of the state. This does not mean that we have to take it as it is. The classic state structure with its despotic attitude of power is unacceptable. The institutional state needs to be subjected to democratic changes. At the end of this process, there should be a lean state as a political institution, which only observes functions in the general field of security and in the provision of social services. Such an idea of the state has nothing in common with the authoritarian character of the classic state, but would rather be regarded as a societal authority. * The Kurdish liberation movement is working for a system of democratic self-organization in Kurdistan with the features of a confederation. Democratic confederalism understands itself as a coordination model for a democratic nation. It provides a framework, within which inter alia minorities, religious communities, cultural groups, gender-specific groups and other societal groups can organize autonomously. This model may also be called a way of organization for democratic nations and cultures. The democratization process in Kurdistan is not limited to matters of form but, rather, poses a broad societal project aiming at the economic, social, and political sovereignty of all parts of the society. It advances the building of necessary institutions and creates the instruments for democratic self-government and control. It is a continuous and long-term process. Elections are not the only means in this context. Rather, this is a dynamic political process which needs direct intervention by the sovereign, the people. The people are to be directly involved in the decision-finding processes of the society. This project builds on the self-government of the local communities and is organized in the form of open councils, town councils, local parliaments, and larger congresses. The citizens themselves are the agents of this kind of self-government, not state-based authorities. The principle of federal self-government has no restrictions. It can even be continued across borders in order to create multinational democratic structures. Democratic confederalism prefers flat hierarchies so as to further decision finding and decision making at the level of the communities. * The model outlined above may also be described as autonomous democratic self-government, where the state-related sovereign rights are only limited. Such a model allows a more adequate implementation of basic values like freedom and equality than traditional administrative models. This model need not be restricted to Turkey, but may also be applicable in the other parts of Kurdistan. Simultaneously, this model is suitable for the building of federal administrative structures in all Kurdish settlement areas in Syria, Turkey, Iraq and Iran. Thus, it is possible to build confederate structures across all parts of Kurdistan without the need to question the existing borders. * The decline of real-socialism was also a result of how the socialist countries used their power both internally and externally, and in the fact that they misconceived the importance of the gender issue. Women and power seem to be quite contradictory things. In real-socialism, the question of women’s rights was a rather subordinate issue, which was believed to be resolved anyway once the economic and other societal problems would be solved. However, women may also be regarded as an oppressed class and nation or an oppressed gender. As long as we do not discuss freedom and equal treatment of women in a historical and societal context, as long as no adequate theory has been devised, there will not be an adequate practice either. Therefore, women’s liberation must assume a main strategic part in the democratic struggle for freedom in Kurdistan. * Today, the democratization of politics is one of the most urgent challenges. However, democratic politics need democratic parties. As long as there are no parties and party-affiliated institutions committed to the interests of the society instead of fulfilling state orders, a democratization of politics will be hardly possible. In Turkey, the parties are only propaganda tools of the state enjoying public alimentation. Their transformation into parties committed exclusively to the interests of the society, and the creation of the necessary legal basis in this context, would be an important part of a political reform. The founding of parties bearing the word Kurdistan in their name is still a criminal act. Independent parties are still obstructed in many ways. Kurdistan-related parties or coalitions serve democratization and are not advocates of separatism or the use of violence. * There is a widespread individual and institutional subservient spirit, which is one of the biggest obstacles in the way of democratization. It can only be overcome by creating an awareness of democracy in all parts of the society. The citizens must be invited to actively commit themselves to democracy. For the Kurds, this means building democratic structures in all parts of Kurdistan and wherever there are Kurdish communities, which advance the active participation in the political life of the community. The minorities living in Kurdistan must be invited to participate as well. The development of grassroots-level democratic structures and a corresponding practical approach must have top priority. Such grassroots structures must be regarded as obligatory even where basic democratic and legal principles are violated as in the Middle East. * Politics needs independent media. Without them the state structures will not develop any sensitivity for questions of democracy. Nor will it be possible to bring democracy into politics. Freedom of information is not only a right of the individual. It also involves a societal dimension. Independent media have also always a societal mandate. Their communication with the public must be marked by democratic balance. * Feudal institutions like tribes, sheikdom, aghast, and sectarianism, which are essentially relics of the Middle Ages, are like the institutions of classic nation-states obstacles in the way of democratization. They must be urged appropriately to join the democratic change. These parasitic institutions must be overcome with top priority. * The right to native language education must be warranted. Even if the authorities do not advance such education, they must not impede civic efforts for the creation of institutions offering Kurdish language and culture education. The health system must be warranted by both state and civil society. * An ecological model of society is essentially socialist. The establishment of an ecological balance will only be accomplished during the transition phase from an alienated class society based on despotism to a socialist society. It would be an illusion to hope for the conservation of the environment in a capitalist system. These systems largely participate in the ecological devastation. Protection of the environment must be given broad consideration in the process of societal change. * The solution of the Kurdish question is attempted within the framework of the democratization of the countries exercising hegemonial power over the different parts of Kurdistan. This process is not limited to these countries, though, but rather extends across the entire Middle East. The freedom of Kurdistan is tied to the democratization of the Middle East. A free Kurdistan is only conceivable as a democratic Kurdistan. * The individual freedom of expression and decision is indefeasible. No country, no state, no society has the right to restrict these freedoms, whatever reasons they may cite. Without the freedom of the individual there will be no freedom for the society, just as freedom for the individual is impossible if the society is not free. A just redistribution of the economic resources presently in the possession of the state is eminently important for the liberation process of the society. Economic supply must not become a tool in the hands of the state for exercising pressure on the people. Economic resources are not the property of the state but of the society. * An economy close to the people should be based on such redistribution and be benefit-oriented instead of exclusively pursuing the accumulation of surplus value and turnover increase. The local economic structures here do not only damage the society but also the environment. One of the main reasons for the decline of the society lies in the effects of the local finance markets. The artificial production of needs, the more and more adventurous search for new sales markets and the boundless greed for ever growing profits lets the divide between rich and poor steadily grow and enlarges the army of those living below the poverty line or even dying of hunger. An economic policy like this cannot be tolerated anymore. This is therefore the biggest challenge for socialist politics: implementing an alternative economic policy, which is not exclusively oriented by profit but rather by a just distribution of resources and the satisfaction of natural needs. * Although the Kurds assign the family a high value it is still a place where freedom does not abound. Lack of financial resources, lack of education, lack of health care do not allow for much development. The situation of women and children is disastrous. So-called honor-killings of female family members are a symbol of this disaster. They become the targets of an archaic notion of honor, which reflects the degeneration of the entire society. Male frustration over the existing conditions is directed against the supposedly weakest members of the society: women. The family as a social institution experiences a crisis. Here, too, a solution can only be found in the context of an overall democratization. Tomorrow: The present situation and suggestions for a solution.